Fifty readers love this post. Summer officially ends in September yet so many people are complaining that it's over. It's not over yet guys! There's still time to go to the beach, or the park or wherever you would like to go! Plenty of time to also enjoy a light refreshing cocktail ! I love blackberries! One of my favorite fruits of all time. Juicy and sweet but a bit tart as well. The perfect fruit for a summer cocktail ! I wanted to add a vegetable to my cocktail as well . Or at least a vegetable liqueur! It's important to eat (or drink !) your fruits and vegetables right? So to make sure you get your daily dose why not have them in a delicious cocktail! I start out with some Purity Vodka from Sweden. It's a delicious, clean spirit with just a touch of vanilla. Purity also has a creaminess to it which is rare for vodka.I add some Thatcher's Organic Cucumber Liqueur.Incredibly refreshing. It's got a great crisp, natural cucumber flavor which I absolutely love. I then add some 18.21 Bitters Lavender and French Sea Salt Syrup. 18.21 Bitters are a premium bitters based in Georgia. It's also founded by two females which I love. Missy and Kristin I hope our paths cross someday! They make some amazing high quality products! This syrup adds a touch of lavender flavor without being to floral and adds an amazing aroma to my cocktail The sea salt balances out the sweetness.Then some Crude Small Batch "Bitterless Marriage" Bitters from North Carolina. Made with hibiscus , lavender and oak. It brinks a headiness and richness to my cocktail without being overpowering. Great stuff! Some wonderful, juicy and plump blackberries are one of the best parts ! It brings back memories of when I would go blackberry picking at camp. 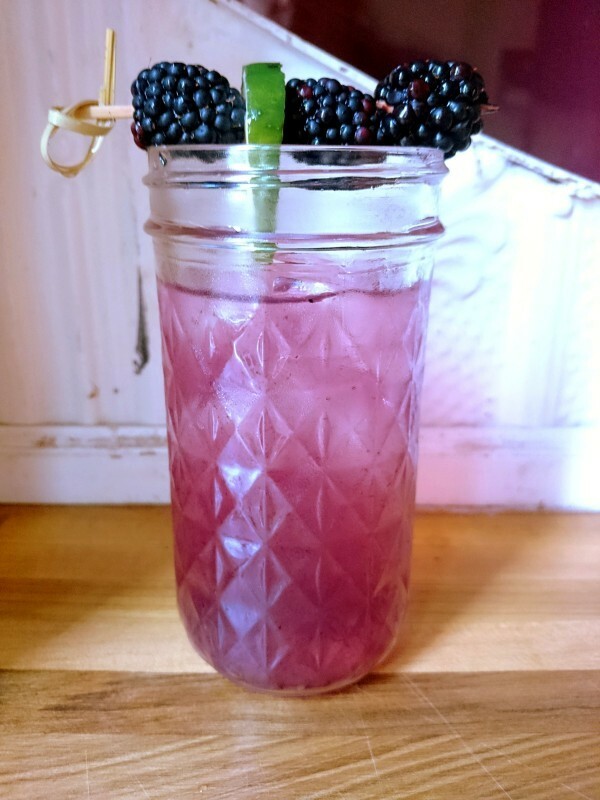 Add some lemon juice , some ice ,shake, strain and garnish with some more wonderful blackberries and cucumber. So to celebrate the remaining days of Summer. Sit back, relax and enjoy an It's Not Over! You'll be so glad that you did! Cheers!! !